Could your old content be scaring away visitors? When we think about Spring Cleaning, most people imagine dusting shelves, clearing out closets, or everyone’s favorite: washing baseboards. 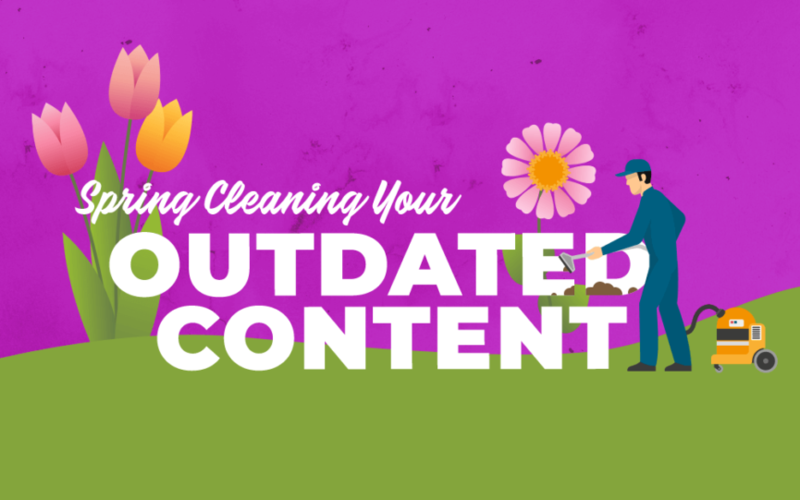 More specifically, I’m talking about cleaning up your outdated content. According to a study from Stanford, 75% of people judge a company’s credibility based on its website. Over the years, consumer tastes change. Content gets dusty. Without consistent upkeep, your site can quickly go from fab to shabby. In ecommerce, your website IS your store, so it’s important that it’s inviting. Let’s take a look at a few areas of your site that may need some attention this spring. If your website is your shop, your homepage is your storefront. This is the first thing visitors will see when they come to your site. Obviously, it needs to look presentable. This doesn’t mean you need saturate your homepage with crazy layouts and animation to impress them. Instead, go for simple, clean designs that are pleasant to look at and easy to use. These attract attention without being obnoxious. If you haven’t already, this is a good time to stop using on-entry strategies. While it may seem generous to provide users with an instant incentive, they increase bounce rates, and can make your site seem desperate. If you need help determining if your site is out of date, trying looking at your competitors’. Notice the differences and similarities. Obviously, you don’t want yours to be a carbon copy of theirs, but it never hurts to take notes and make changes accordingly. Content should be like bread. Versatile, easily consumable, and thrown out when it’s stale. Topics you covered several years ago may not be relevant today. For example, a quick search reveals that many blogs still have content related to Myspace Optimization. While Myspace is still technically around – it’s largely irrelevant to ecommerce, and it definitely doesn’t make your site look current. Indeed, some of the articles I found were from 2004 or earlier. If you’re still hanging onto content that’s clearly dated, it’s probably time to either update or eliminate it. Over the years, search engine optimization has changed significantly. It used to be commonplace for sites to write pages to specifically emphasize short-tail keywords as much as possible. This led to awkward insertions of terms that may or may not have fit into the page well. Google has since re-formatted the criteria it uses for rankings, preferring high quality, long-form content over short, buzzy soundbites. Although most websites have figured this out and moved on, many still have old content that follows this format. For the sake of your site’s reputation, it’s best to either remove or re-write these to follow a more cohesive format. The internet has come a long, long way over the years. A few decades ago, websites couldn’t even support images. Today, it’s hard to imagine a pure text experience. As time has gone on, best practices and style have changed immensely. This is another instance where looking at your competitors can be helpful. Individual styles and tastes vary to be sure, but there are several design elements that are no longer helpful. Flash Animation – Once widely used, now almost universally despised – this format is cumbersome to load and generally looks dated. In fact, it’s being discontinued by Adobe. If your site still uses Flash, now is the time to update. Blatant Stock Photography – Stock photos are great for filling gaps in a website. But using too many makes your site look impersonal and phony. Overly-smiley people in front of white backgrounds are okay as a last resort, but more realistic photos give you site a sense of depth and personality. Poor Mobile Experiences – Since 2010, mobile web-access has exploded in popularity. Users now expect your mobile site to work just as well as your standard site. If you site isn’t optimized for mobile, that’s a change you’ll want to make sooner rather than later. Just like any space, your site needs to be cleaned up from time to time. You probably don’t need to completely remodel. But getting rid of dated elements is a great way to make your site more attractive to visitors, and improve conversion rates.